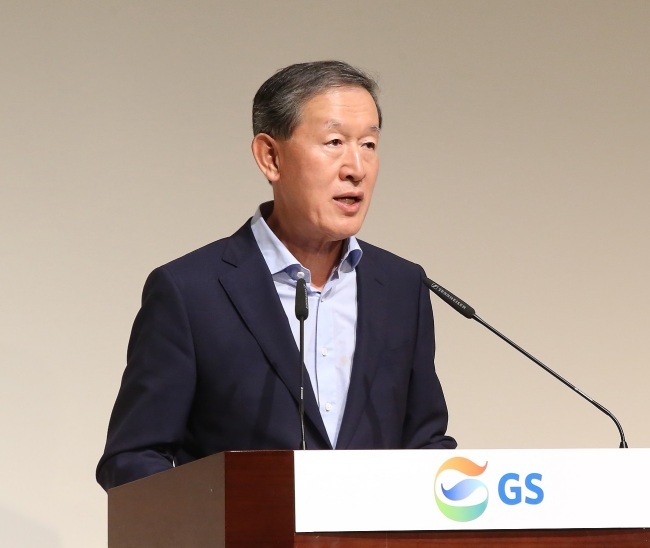 GS Chairman Huh Chang-soo urged the firm’s executives to create an environment where new challenges and innovation are encouraged at a management meeting held on Wednesday. For the future growth of GS, Huh encouraged the affiliates’ new businesses, including GS Caltex‘s new investment in olefin business, GS Retail’s move into Vietnam with its convenient store GS25 and GS Power‘s building additional power plant and adoption of liquefied natural gas. GS Caltex invested around 2 trillion won ($1.8 billion) in its plants located in Yeosu In February with the aim of producing 700,000 tons of ethylene and 500,000 tons of polyethylene by 2022. GS Retail opened its first GS25 in Ho Chi Minh and plans to open another 30 stores this year. The chairman also stressed the group should find a new cash flow by taking initiatives in innovation. “As innovative technologies, including artificial intelligence, self-driving cars and fin-tech, are fast developing and business models and fast changing, we should see the other side of these changes and find new business opportunities,” he said. The group said GS Home Shopping is a model example as it has continued to invest in startups at home and abroad since 2011. They have invested a total of 270 billion won in 380 companies in Korea, the US, China, Southeast Asia and the Middle East.